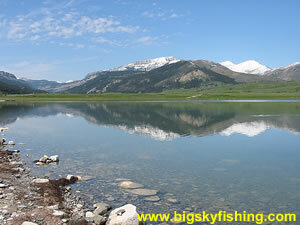 The Southern Rocky Mountain Front Scenic Byway runs for 28-miles between Augusta, MT, and Highway 200. 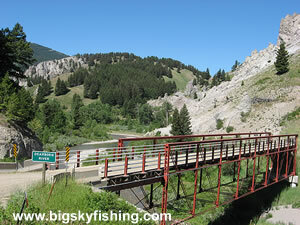 The route follows Montana State Highway 435, a paved and gravel road that is generally in excellent condition. This scenic drive also serves as a “scenic diversion” for those traveling between Interstate 15/Highway 200 and Augusta. This route is much more scenic than the more popular US 287. Highlights of the route include the Rocky Mountain Front, Bean Lake, the Dearborn River and the Dearborn River High Bridge. Since the trip parallels the Southern Rocky Mountain Front, the views are excellent. Anyone who enjoys traveling through an area where the prairie meets the mountains will greatly enjoy this scenic drive. Beginning in Augusta, the drive heads south on Montana State Highway 435. The road is paved outside of Augusta and, in 2010 at least, was in excellent condition. 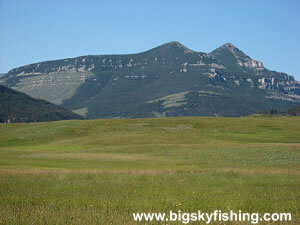 Initially, the route passes through the prairie, with the peaks of the Rocky Mountain Front rising in the distance. A butte called Haystack Butte sticks out prominently, too, and adds a “classic western feel” to the drive. The mountains off in the distance are noticeably devoid of trees. Years ago, a major forest fire burned much of the Scapegoat Wilderness and even spilled out onto the prairie floor. While the fire scar in the distance does detract from the view a bit, the fire scar gives way to forested mountains as the drive progresses to the south. After 15 miles, the road reaches a junction with the road that leads to the scenic Bean Lake, which is just a mile off the scenic drive. While Bean Lake doesn’t have the best fishing in Montana, the lake is lightly used and offers superb views of the Rocky Mountain Front. Beyond Bean Lake, the Southern Rocky Mountain Front Scenic Byway changes character. Between Augusta and Bean Lake, the drive cuts through almost exclusively prairie, slowly getting closer to the mountains. Now though, the drive begins to meander through the forested hills and cuts along the edge of the mountains. Soon the drive drops down into Dearborn Canyon. The road then crosses the Dearborn River on the Dearborn River High Bridge, a bridge listed on the National Historic Registry. This 160 foot long, one-lane bridge has a wooden plank and is more than 100 feet above the river below. After a rather steep climb out of Dearborn Canyon, the route begins to slowly angle away from the mountains. Soon, the road again is out in a vast expanse of grass, with the peaks of the Rocky Mountain Front jutting off the prairie in the distance. The drive ends at the junction with Highway 200. From here, continue down Montana 435 to reach Interstate 15 at Wolf Creek, or jump across the Continental Divide on Highway 200. Overall, a trip down the Southern Rocky Mountain Front Scenic Byway is a worthy diversion. The views of the Rocky Mountain Front are excellent, the traffic is virtually non-existent and the route is far more enjoyable than plodding down US 287. Moreover, the road is generally in excellent condition and is suitable for trailers. For those interested in taking this drive, a suggested time of year is in the late-spring and early fall, as it’s during this time of year that the prairie grass is green and snow still lingers in the mountains. Highlights : Excellent Views of the Rocky Mountain Front and the adjoining prairie, Bean Lake, the Dearborn River High Bridge, the Dearborn River. Road Type : Paved outside of Augusta. Then converts to a good conditioned gravel road. Traffic : Very light to non-existent. Season : Year-round, except during periods of winter storms. The gravel portion of the drive is not recommended during very wet or muddy conditions, especially for 2-wheel drive vehicles. The map below shows the route and location of the Southern Rocky Mountain Front Scenic Drive and other nearby scenic drives. The drive begins just outside of Augusta, Montana. Bring your tent, camper or RV, as there are no services of any kind located along the drive. For in-town lodging, a small hotel "might be" in Augusta. Gas and other supplies also can be picked up in Augusta. Better lodging options are found in Choteau and especially Great Falls (an hour+ away). A developed campground exists at Bean Lake. Primitive camping is also available at various spots along the drive, as the route passes through large swaths of federal land.